The Henry Johnson memorial in Washington Park, near Madison and Willett, and now includes a replica of Johnson's Medal of Honor. "It means that we brought justice to Henry Johnson." 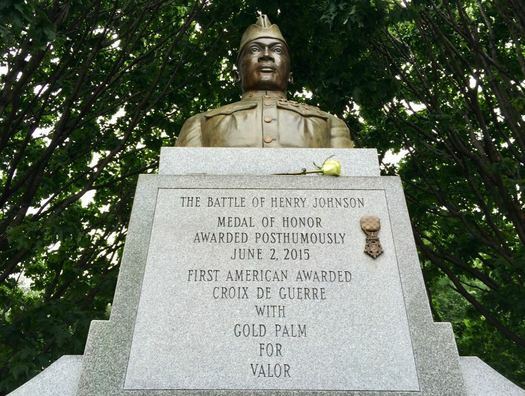 That was how James Dandles -- a Vietnam War veteran -- described the addition of a replica of the Medal of Honor to a monument commemorating World War I hero Henry Johnson in Albany's Washington Park Monday. Dandles was part of a group of veterans and officials who worked for decades to get Johnson's heroism officially recognized. "It's been a long, long time coming." 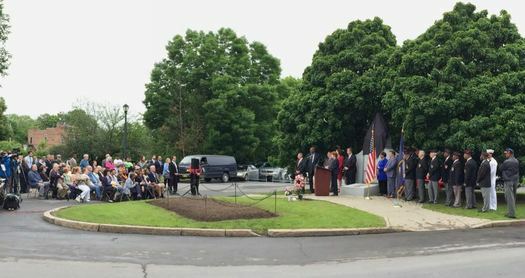 Monday was the first Henry Johnson Day in the city of Albany, to honor the Sheridan Hollow resident who fought off a group of German attackers to save a fellow solider while serving with the famed 369th Infantry Regiment -- the "Harlem Hellfighters" -- in France. Johnson was initially hailed as a hero upon returning home to the United States. But after he started speaking out about the racism he had experienced in the military he was marginalized. War injuries kept from holding a job, and his personal life fell apart. He died at age 32, estranged from his family. Thanks to the efforts of many people -- including Dandles and the late John Howe -- Henry Johnson was finally awarded the Medal of Honor in 2015. The first Henry Johnson Day in Albany also marked the city's first granting of the Henry Johnson Award for Distinguished Community Service, intended for Albany residents who have contributed to the community but not gotten the recognition they've deserved. The inaugural recipient: James Dandles, for those efforts to gain official recognition for Henry Johnson. 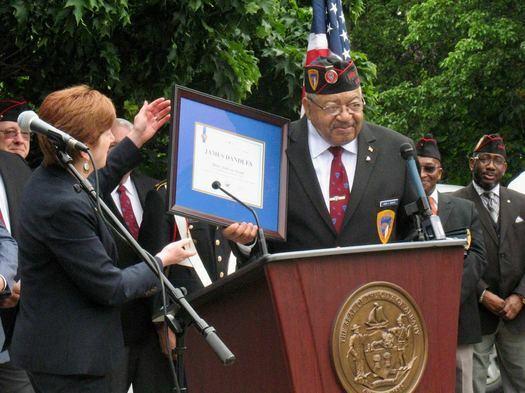 Dandles -- who, like Henry Johnson, served in the 369th Regiment and has served as president o the Albany District 369th Veterans Association -- said Monday he was surprised to hear that he had won the award. "We wanted to right a wrong," he said of the effort on behalf of Henry Johnson. "So we set out to do that in the early 70s, a group of guys, and it went on and on and on, with a lot of political leaders, and it came to fruition today. ... We never thought it would take so long."